I can never last the 100 days of Running Challenge. I have 100 excuses to not take it up. But actually my biggest reason is that I have commitment issues. Clearly the world on my facebook is getting more daring and more committed, year after year. This year I felt that this challenge was spreading like fire on Facebook! It’s also a no-brainer on why taking up the 100 Days of Running Challenge is well intertwined with Facebook! In a good way! Because announcing it on Facebook – let’s people cheer you, the peer pressure ultimately brings in the discipline and it holds you accountable to your challenge! With so much goodness to this challenge, is there something we are missing? Does it give injuries, is it too much on the runner’s family, what about recovery? So I got my questions listed down and sent to Bijay Nair who as been the Social Media Heartthrob of this challenge to send me his honest and truthful answers! Has 100 days of Running made you a Run addict? Bijay – It’s a tricky question , I have been running for 10 years plus and also when I was in Armed forces. 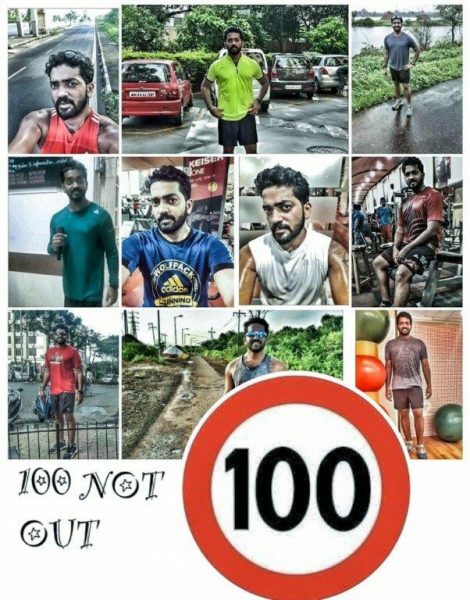 For me 100 days turned me in to more disciplined runner albeit without any training schedule . Rather than saying Run Addict , I would say Running became a Habit . Does it not lead to injuries? Isn’t that the biggest fear behind this? I mean if one stuck to doing the mandatory 2 kms, then maybe it’s ok, but beyond that? Bijay- Being a experienced runner , the plunge towards 100days was very thought over decision . I have my close circle of friends and there was a mix reaction from them too . Injuries to be very frank , I recovered from my heel pain of 3 years with GAIT change during this 100days . It did reverse effect on me . But for anyone taking this plunge needs to assess themselves . My advise would be assess yourself before committing to something like this . It requires a whole lot of dedication . Yes in my 100days I had only one injury scare to my plantar , it was more because of my landing in a pothole . Bijay-Recovery is a very important factor and am a firm believer in recovery . My biggest weapon was the Foam Roller , I use to do foam rolling often . At weekends I use to take my sports massage without fail . My therapist Prashant did a great job . Challenge was when I use to miss my morning runs and then I had to run in the evening followed by run next morning . Stretches and yoga was another great way to recover . I have known friends who didn’t take care of the same and had to forego the 100days of running . Plus , Navy training has taught me many quick recovery methods . How big a role does Social Media have in making this a phenomena? Isnt it the only reason people actually sign up for 100 days of running? If Fb wasn’t there for the adulation, would people still do it? Bijay-Hmmm….. yes social media is the biggest change . It has its positive and it has its flip side too . You know what I am running from many years and those times when orkut was the only social media platform . I have been running 9 days 9 colors 9kms run from almost 10 years when I was not even known on social media . But yes , as you said it does have impact . Because of being a runner author and promoter of running , I did enjoy posting my runs on social media . I use to post my runs mostly on Running forum only and not even on my wall . But yes , I believe if I post my runs which is honest on social media then what is wrong in it . I believe anyone who is social media savvy and post that 2 to 10 kms , still takes that effort to move their arse and run , so what is wrong in posting . Am sure it will motivate atleast 01 person . But yes , if people follow you , there is always the peer pressure. Does it become a chore? Bijay-Instead of chore or addiction , let me use a better word “ Habit” . After 20 days your body , mind and soul amalgamate to take you through . I firmly believed , if it was only for the sake of doing I would have never did that. Were there days you felt you couldn’t it anymore? Or were travelling and you wished that you didn’t have to do this? Bijay-Yes ,atleast 5 times during this 100days . I am a working professional and I head a department , so my professional commitments are huge . My travel season is ,mostly May, June , July . Couple of days I had to run at wee hours in dark and once at airport . It did feel crazy , but sometimes craziness is fun , isn’t it . My biggest challenge was running on 99th and 100th day , since I was going through a family crisis . I am blessed to have a lovely family who supported me through this 100days . How did your family cope up with it? did this test their patience sometimes? Bijay-Not at all , my family has been very supportive . My wife , my both brothers are runners , my mom is a exsportswoman , my dad is a fitness enthusiast and my lovely daughter she too supported my run . But yes at times , they were worried , when I had a low BP scare due to my thyroid level changing. What would you tell people about the nutrition needs? Bijay- Since , I was running an average 8kms per day I was very particular about my food and nutrition . I freaked on eggs, legumes, chicken and pulses. I lost 7kgs in this 100days , my thyroid level altered from hypo to hyper , that never happened in 10 years of having thyroid. Nutrition is important , I use to have Fast and Up protein and reload/recover during my runs . What is your over all analysis to this 100 days of Running? Made you a better runner? Or a better human being? Will you do it again? Is once enough? Would you recommend it to everyone? Bijay- Believe me I became a more commited and dedicated runner . I valued my time . I improved drastically as a runner . I did two personal bests in two of the toughest races of india and am glad that I did 100days. Nevertheless , I will not run again since it requires a huge commitment . Since my work profile entails whole lot of work pressure , commitment going forward is a question . Your deepest learnings on running because of 100 days of running?